I always wanted to have a beautiful garden of my own. The sight of freshness is just so relaxing with greens everywhere. It would even be more exciting with a pool and other lovely garden features. What I dream of is a garden that gives me my own sanctuary with nature. It would no doubt shoo my stress away. But of course, before I dream of a garden, I have to get my own home first. 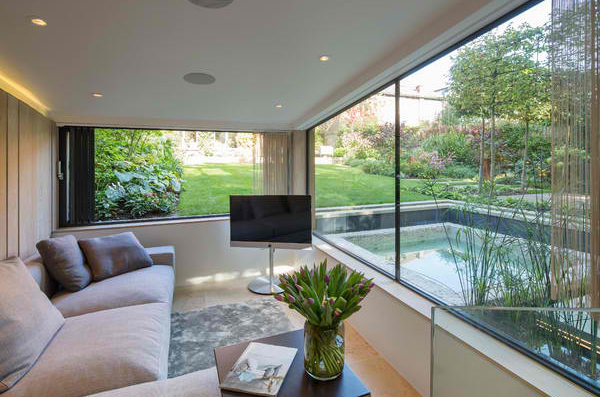 Anyway, dreaming is just free and if I have a garden as stunning as this Highgate Garden Room that we are featuring today, I’d definitely spend my time dreaming her 24/7! After a renovation of the owner’s house, they wanted to give their garden a new look. 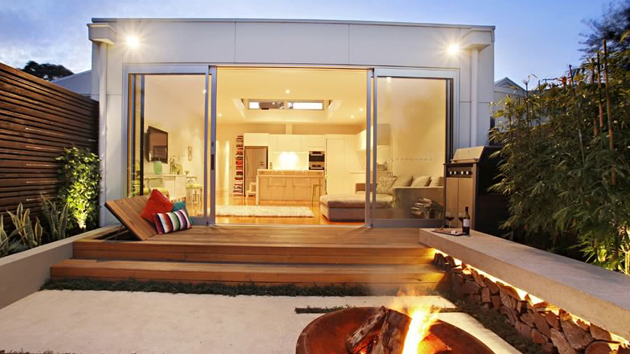 A building was incorporated in the garden with a living room. 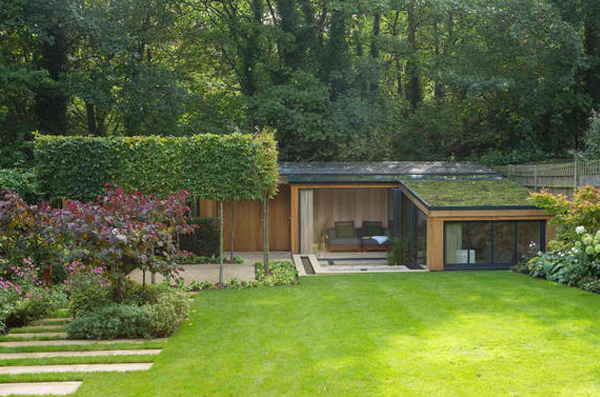 That living room has a transition from the garden to the woodland beyond it. 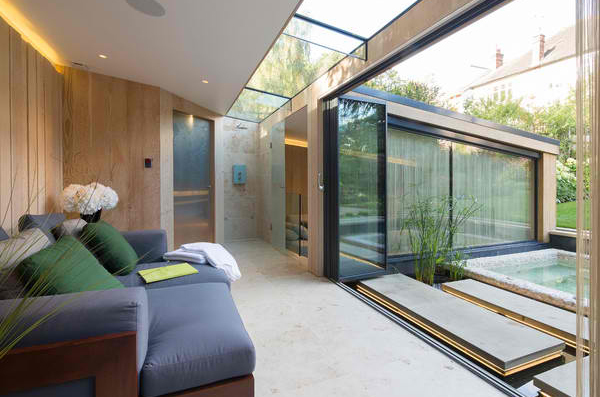 The building is bathed in natural light complementing with the Zen-like spa feel of the area. 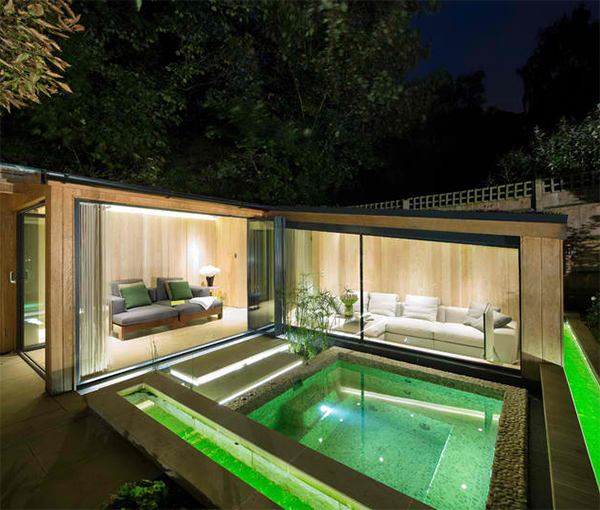 The sunken hot tub gives the users a feeling that they are in a pond which adds to the Zen feel of the space. Fir panels are used for the wall and limestone for the flooring. Let us take a look at this beautiful garden. The exterior looks like this. The sight is already very much inviting especially with the green roof. But it is even more promising with a closer look. Having glass walls is just right because the view outside is very much splendid! 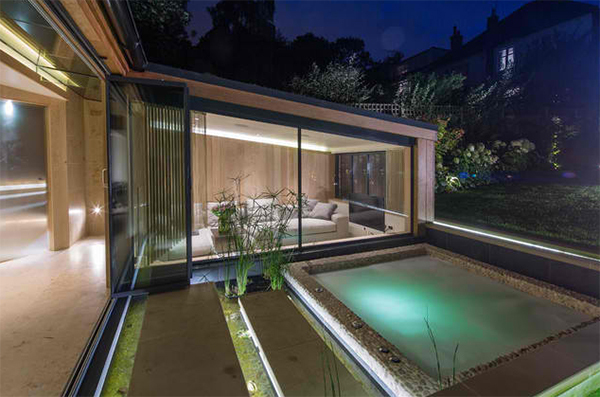 The dark frames of the glass highlight the sleek contemporary lines of the structure and added appeal to the garden. 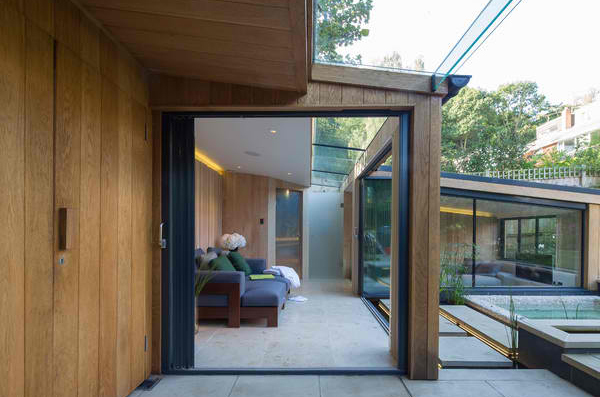 A comfy seating area is seen on one side which opens to concrete lighted steps that leads to the spa. Aside from the area seen above, there is also a living room that gives a clear and direct view of the spa as well as the outdoor beauty. The view is even more fascinating during the night while you enjoy watching movies or just cuddling with your love one. This is the spa area. 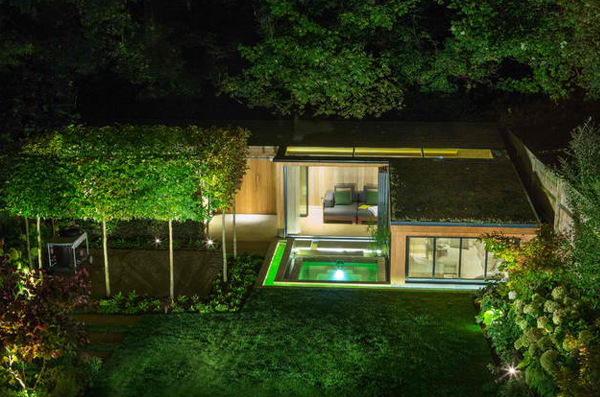 It has green lights to replicate the color of the garden which is one good idea to extend that relaxing feel from nature. The spa could no doubt make you feel like you are in your own paradise. Ahhh…I so want to dip into those! The garden is indeed something anyone would dream of! Even that outdoor space with creatively designed tree surround is very gorgeous! You can’t blame me if I want this garden. I know after seeing it, you want it too. Oh, well, I can’t blame you too because this garden is indeed very much breathtaking! I would spend most of my time in here. This paradise from Folio Design LLP would even make us think that fairies might exist in the area because of how green and whimsical it is! Not sure if having fairies your garden is cool or creepy. But with or without fairies, this is one garden I will surely be digging to achieve for my dream house!